This residential complex offers a variety of beautifully designed homes and apartments to suit all tastes. 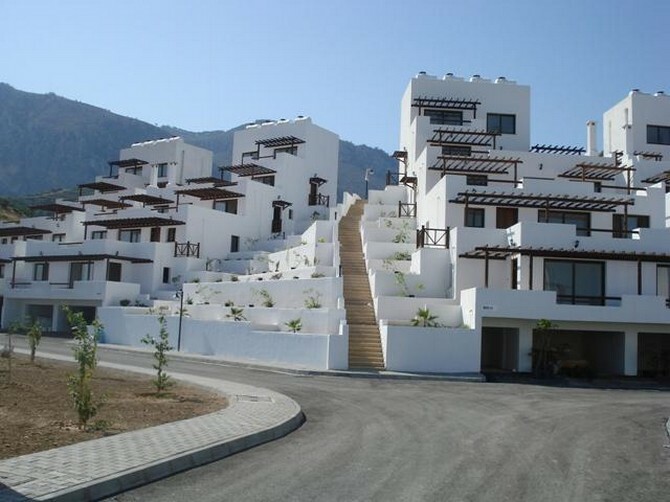 Stage 1 comprises 10 villas alongside the artificial lake with superb sundecks over the lake and facing the sea. Set into the hillside and stepped in 4 levels are 10 penthouse duplex apartments, 18 2 bedroom apartments and 10 1 bedroom studio apartments. Every apartment leads on to a large open terrace and all have views towards the sea below allowing for open style living al fresco and are set among luscious landscaped gardenss. The facilities include swimming pool, sundecks, sports arena for tennis, basketball and volley ball. The whole complex is secured by limited access by road with watchmen/guards maintaining security and ensuring privacy.